Hi everyone! 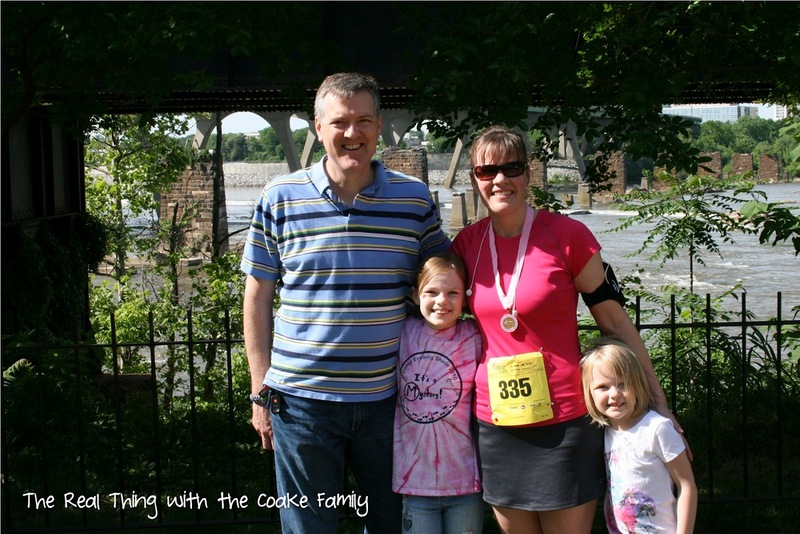 Today I have a special treat for you – KC from The Real Thing with the Coake Family is here to answer some questions about running and half marathon training. Actually, we decided to swap blogs today and you can find me over at her blog answering the same questions! Check it out! And please read what KC has to say – she has been running longer than me and is a real inspiration, plus I love all the great, thoughtful answers she sent me! Hi everyone at Not in Jersey! I’m KC and I write a blog called The Real Thing with the Coake Family. I’m a 40 year old stay at home mom of the two cuties you can see pictured above. I blog about running, scrapbooking, fashion for less, making cards, crafts, projects, cooking, our homeschool projects and all kinds of things that usually center around my family. I am happy to be here with you today while Dara is over at my blog today. We are both training for a half marathon on the same day and have gotten to know each other a bit through our blogging. We thought it would be fun to swap blogs for the day and write about running. I hope you enjoy it! KC – I first started running about 3 years ago. My cousin and I were supporting each other in our journey to lose weight. We would occasionally get together at the halfway point between our cities to walk and talk. On one of those walks, she mentioned doing a 5k together. I’m not sure, but my guess is that I told her she was crazy. Then the idea kept ruminating in my mind and I couldn’t let it go. I called her and told her I wanted to do it. We signed up for our first 5k together. We finished it too! We did a lot of walking and some running. We were a little concerned at being the last to finish, but after that I felt strong and felt like I wanted to give running a try. The following day, I went out and ran. I really ran, not just walk/run. I think that is when I got hooked and began training in earnest. KC – There are so many reasons. As I said, I started running while on a journey to lose weight. I have lost and maintained a 40lb weight loss. It feels so good and I feel so good. I don’t remember ever feeling this strong or fit in my life. At 40, I’m proud to say that. I really like feeling this good. That is one of the main reasons I continue. I also continue because I amaze myself. I don’t mean that in any conceited way, I mean that I keep pushing myself to see what I my body is really capable of and I consistently amaze myself. It has been a fun journey. I always knew I was strong in spirit and now I know I am strong in body as well. It is also a fantastic way to burn a lot of calories and still get to eat fun stuff and keep the weight off. KC – I started by training to run a 5k. My cousin and I completed two 5ks together in which we walked and ran. I wanted to complete one in which I ran the whole thing. It took me a long time to get there due to a hip injury and much more complicated surgery and recovery than anticipated. It has been a long journey. Anyway, during that time, my cousin and I set a goal to run a half marathon together. I mostly wanted to see if I could actually do it. After my surgery (and forever long recovery), I started to build back up slowly again. I did things a little backwards and ran a 10k first, than ran a 5k. I decided to go for it and commit to running the half marathon. Now I know I’m half crazy! 13.1 miles is a long run! KC – Well, I’m not sure that what works for me will work for anyone else. That is the thing that I think that running has really taught me (one of the many life lessons from running), you really can’t compare. What works for me may not work for you. My time, stride, speed are not going to be yours. That is the way it is supposed to be. Running is about you being you and you embracing you. That being said, when I’m on a long run I have done a few things to keep going. A while back, before I dropped my phone and cracked it, when the gps function was working better on my phone. I had an app on my phone that would tell me how many miles I had run. I had it set to tell me each time I hit a mile. I would play a game with myself. If I was out to run 8 miles and I heard that 1 mile marker, I would say to myself, “Only 7 more miles to go.” It worked for me. The other thing I have done is break a long run into segments that felt doable for me. Let’s say I was out to run 8 miles. 4 miles is a doable distance for me. It doesn’t feel too hard or unattainable. I would break my 8 into two 4 mile segments. That way when I heard those mile markers come up, I could say, “Only 3 miles to go.” Even if it really was 7 miles to go. Or I could say, “This is just a 4 mile run followed by a 4 mile run.” It sounds kind of dumb as I write it out, but it worked for me. It is such a mental game for me, this running thing. Lately, what has worked for me is completely different. I no longer have the chime telling me how far I have run and in some ways it is a good thing as I don’t focus on the distance as much (and how torturous it feels). Now, I remind myself how disappointed I’m going to be if I don’t do what I set out to do. For me that works, I know for a lot of people, that wouldn’t work. Right now, I find myself so disappointed in myself when I get out there and talk myself into stopping, because most of the time when I get home, I rehash it and realize I gave up rather than pushing through. Then I’m disappointed in myself. So rather than go through all of that, I push through and see what I’ve got for that day. It may mean walking a bit more to get it done, but get it done, I do. It feels great! In the long run (pun intended), I know it is better for me too. I get to see how strong I really am and what I can really do. I get to be proud of myself and check another week of the training list! Woot, Woot! KC -To run the half marathon in November. My goal is to complete it in under 2 hours. I’m a bit off that at the moment, but I’m gonna keep on trying. After that race, at the moment, I have no idea of my long term plans. I like the idea of continuing to race a few races a year. I like the idea of trying for a faster time in both the 5k and 10k distances, but as to specific long term goals/plans, I don’t have any right now. I love the alone time. There is no one there whining or asking me to do things. There are no interruptions. I. can. have. a. complete. thought! It is a fantastic stress reliever. I also really love the life lessons I have learned through running. Like the lesson of not comparing that I blogged about and mentioned a bit here. You can read that post here. Or the lesson of how strong I am as a person and physically. It has been a very empowering journey for me. One I have fought to keep in my life. KC – My favorite gadget used to be my phone, but then I went and damaged it. Boo! It was my favorite gadget because I could use it to track my runs. I had an app that would give me the distance, pace, etc. It was great, then it would automatically upload my run to Daily Mile. Loved that. I also have an app that I can listen to my satellite radio while I run. Works great for me because listening to the same music on an ipod would drive me batty. Any tips of advice for new runners? Start slow. I started, both times I started running, by completing an app (see there is my phone again!) called C25K, which stands for Couch to 5k. It is an interval training app. It will slowly build your stamina from nothing to running a 5k. The first day, if I remember correctly, you will walk 90 seconds and run 60 seconds, etc until in week 5 or 6 you are able to run for a full 20 minutes and on up to a 30 minute run. I would also say, listen to your body. If something doesn’t feel right or it hurts, listen to that. There are times to push through and there are times to stop. Knowing the difference can only happen by listening, truly listening to your body (and not the gremlin in your mind telling you that you need to stop because you can’t do this). If you would like to follow my half marathon training, you can read my inital trianing plan here or you can see my latest half marathon training post. We are currently have a discussion about electrolyte replacement drinks along with my training updates. I’m learning and thought others might like to learn as well. You can also see one of my latest crafts I made for one of my daughters, a pom pom scarf for an American Girl Doll. I’ll even teach you how to make one! I’ve got all kinds of things going on over on my blog. Thanks so much for reading and joining in Dara and I’s fun today! You can follow KC from The Real Thing with the Coake Family on Twitter, Facebook, Google+, Pinterest, or via your email or favorite reader.